Taco Catering North Platte: It's Time for Knockout Tacos! 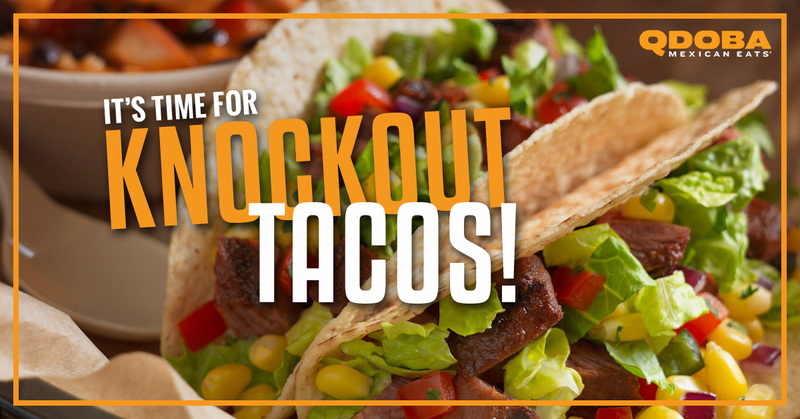 It’s Time for Knockout Tacos! Qdoba satisfies those cravings, the cravings for the best Mexican eats, for late night munchies, and for new and innovative taco flavors. We’ve got them! This week we’ll look at four of the six newest members of the Qdoba flavor family! Don’t forget that our taco catering can feed your next end-of-the-season sports party or office party! We took savory, juicy chicken, succulent bacon, added our hand-smashed guacamole, topped that picante ranch dressing, our famous pico de gallo, and creamy cotija cheese to make the Mad Rancher. The spicy deliciousness of this taco will have you in our corner for sure. The Triple Threat is the perfect combination of bacon, steak, and three-cheese queso combined for a three punch combination that will have you begging for more. Really, you’ll want more bacon, more steak, and more cheese, and we’ll deliver! But back to the taco! These three partners in crime also have fajita veggies, pico de gallo. and cotija cheese to make this taco irresistible. Try this amazing combination of fresh flavors that will awaken your tastebuds. The tangy tequila lime chicken compliments the salsa verde, and the cilantro, minced onion, and cotija cheese add an up and down to the mix that will tantalize your tongue. All this *and* our hand-smashed guacamole combine to make a taco that will have you coming back for seconds. This is a taco with a twist. We took a soft tortilla and spread a bit of warm, luscious queso on it, and then folded it around a crispy taco shell to make a double shell that delivers taste and crunch. That’s the first punch to get you! Then the ingredients of pulled pork, salsa rojo, shredded cheese, lettuce, pico de gallo, and cotija cheese are added — no wonder it takes two taco shells to hold all this goodness! Call us in North Platte to save the date for a catered Qdoba meal or stop in and indulge in a plate of Knockout Tacos!